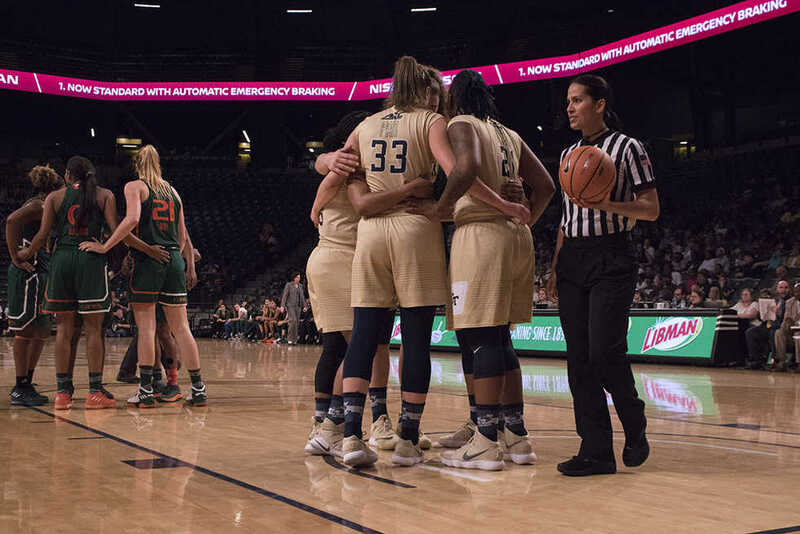 The fate of the Tech women’s basketball’s season came down to the wire last Thursday, but ultimately the Jackets were toppled in the third round of the Women’s National Invitational Tournament by Alabama, 61-59. Tech built up a strong lead midway through the first quarter and led by as many as 17 in the second quarter, but Alabama closed the gap to come even by halftime at 29-29. Tech was able to keep their momentum entering the third quarter and staved off Alabama for as long as possible, but the Crimson Tide picked up their first lead of the game. After trading points, Alabama and Tech pulled even at 59-59 with less than thirty seconds to go. Alabama hit a layup to take the lead with 5.5 seconds on the clock and was able to keep Tech from scoring before the clock expired, sending the Tide to the WNIT quarterfinals. For Tech, it was a disheartening ending for a team that reached the finals just last season, but it was not without a solid effort from the team — forward Breanna Brown and guard Francesca Pan each recorded 12 points, while guard Kierra Fletcher came up just two points shy of a triple-double. Five different players recorded at least seven points in the effort. What sunk the Jackets, despite strong efforts from the starting five and bench, were free throws; the Jackets shot just 44 percent from the line, despite having shot at a 64.8 percent clip during the regular season. The Jackets missed 14 shots from the line —their most since whiffing 14 times against Baylor in November of last year. If just three of those fourteen wayward shots had dropped, the Jackets would be singing a different tune. Up until Thursday night’s game, the Jackets had yet to face a significant challenge in postseason play. In the first round of the WNIT, Tech easily handled Bethune-Cookman, blowing them out 85-32 and winning by their largest margin of the season, 53 points, as four starters went for double digit points. Against Bethune-Cookman, forwards Lorela Cubaj and Zaire O’Neil posted double-doubles, and freshman Cubaj finished three assists shy of a triple double. Tech then proceeded to run up the scoreboard even further against their opponent in the second round, demolishing the University of Alabama at Birmingham 91-47. But when Tech came up against an evenly matched opponent, they simply could not finish the job, and it cost them. Tech’s loss to Alabama marks the end of the collegiate careers of point guard Imani Tilford, forward Breanna Brown, guard Antonia Peresson and forward Zaire O’Neil. O’Neil leaves Tech well decorated, having picked up ACC Sixth Player of the Year honors in her final season. O’Neil averaged 20.0 minutes per game off the bench for the Jackets, recording 10.1 points per game and 5.4 rebounds per game. Another highlight of the season was five-star recruit Kierra Fletcher; her rebounds per game ranked second in ACC play among freshman while averaging 8.7 points per game. For her efforts, Fletcher was named to the ACC All-Freshman Team this February — the eighth player to earn the honor under Jackets coach MaChelle Joseph. It was a disappointing loss for the Jackets, who fell in triple overtime to Michigan in the WNIT Championship game last year 89-79 and had clear hopes to take care of unfinished business. Still, the Jackets can enter the offseason feeling hopeful. With two former All-ACC Freshman honorees in Pan and Fletcher, a recruiting class ranked No. 7 overall by Prospect Nation and a taste of postseason action under their belts, the Yellow Jackets certainly look poised to go dancing come next March.